Like many data-driven organizations, utilities often become involved with maintaining numerous data silos underlying the systems used to manage their business. Often the focus becomes managing the data silos rather than leveraging the systems to the benefit of the enterprise. To correct or avoid this situation, enterprises must establish a strategy that includes best practices around people, processes, and technologies to facilitate agile and adaptable information management solutions. This strategy, called Enterprise Information Management (EIM), encompasses five key components: Vision and Strategy, Governance, Core Processes, Organization, and Infrastructure. EIM vision and strategy focuses on developing a comprehensive framework and effective road map for iterative and incremental implementation of an enterprise approach to information management. This approach will lead to accurate, consistent, secure, and transparent access to data that flows seamlessly and continuously throughout the enterprise. EIM vision and strategy promotes consensus among business and IT on the meaning of EIM, what problems EIM will address and the value it will bring to the enterprise. 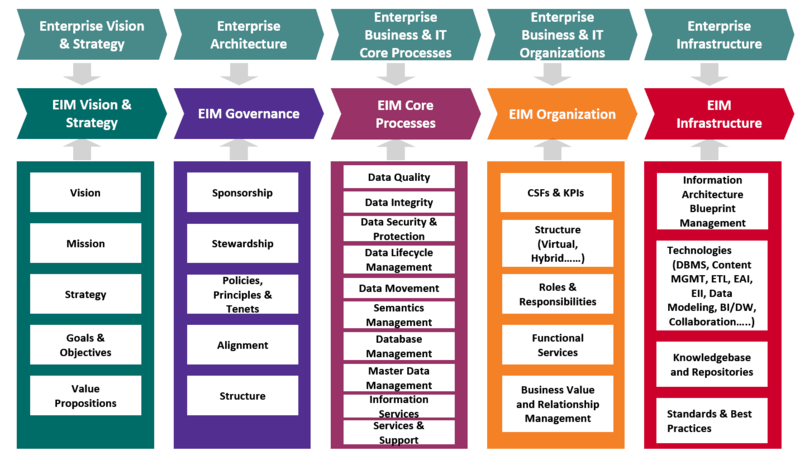 EIM governance is required to achieve alignment between business and IT as well as to establish respective roles and responsibilities for data and information management across the enterprise. The governance structure addresses the development, maintenance, communication and enforcement of data management policies and procedures, in addition to the data quality, services, tools and technologies needed to move to an enterprise-wide data management and services culture. EIM governance is critical to ensuring that stakeholders feel confident in leading the charge toward realizing EIM vision and strategy. EIM includes the definition of core information management processes that support EIM governance and services as well as integration of the processes at user, business and data levels. These core processes target increased accountability and transparency of information across the enterprise and define metadata and master data strategies. Semantic formalization of information is added to the EIM through the development, management and use of an Enterprise Semantic Model (ESM). An ESM provides consistent design and implementation of data and information services across transactional and analytical systems. A complete EIM strategy addresses the organization required to ensure a successful EIM initiative. It provides a formal mechanism for developing required EIM core competencies and enables the realization of EIM’s value by both IT and business. EIM organization considers key performance indicators and critical success factors as well as roles and responsibilities, structure, and deployment using a logical, incremental approach for resourcing.